Pope Francis performed a Blessing of the Motorbikes as thousands of Harley-Davidson owners lined outside the Vatican to celebrate the 110th anniversary of the Milwaukee brand. Over 100,000 and maybe more, leather clad passionate Harley Davidson bikers and enthusiasts ‘loudly’ invaded the Eternal City for the European leg of Harley-Davidson's worldwide tour. The 110th Anniversary, is a year-long series of global celebrations that will span 11 countries on six continents and will culminate in the company's hometown of Milwaukee during the last weekend in August. The Roman celebration attracted bikers from across the world, and on Saturday, 3000 bikers rode from Port of Ostia to the Colosseum in the Harley Davidson parade, and 1400 fortunate bikers were picked to take part in Sunday’s blessing, before the ritual Angelus prayer, outside Saint Peter's Square with their bikes lined up along Via della Conciliazione. 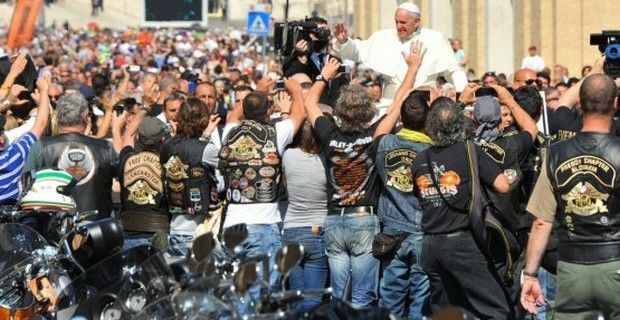 This isn’t the first time that Harley Davidson has received a papal blessing. Last October and ahead of the official celebrations, Willie G. Davidson, grandson of one of the company’s founders, presented to Pope Benedict XVI, two 110th anniversary commemorative motorcycle gas tanks to bless and autograph. Both tanks were mounted on two motorcycles - one is currently displayed in the Harley-Davidson Museum, while the other was auctioned off to support the Good Samaritan Foundation. However, Pope Francis got a much better deal than his predecessor from the American motorcycle company. Mark-Hans Richer, Harley-Davidson senior vice-president, presented the Pope with two bikes for the Vatican gendarmerie to use (that will join the two Ducati Multistrada 1200s that the previous pope received from the Italian manufacturer in 2010) and a black leather jacket with an eagle on the back. Our promise to our customers is to offer them once-in-a-lifetime experiences that few other brands can fulfill," said Mark-Hans Richer. "Having our customers treated to the blessing today fulfills that promise of epic adventures."